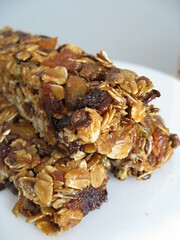 These energy boost bars adapt to be gluten, dairy or gluten and dairy free snacks. Large bowl if unable to use a large pan. Preheat oven gas mark 5/190C/375F. Line a 23cm square baking tin with baking parchment greased to prevent the mixture sticking. Measure the butter (or variant); sugar; honey; add to a large heavy based saucepan once butter or oil is heated and melted add the prunes, apricots, dates boil for two minutes once sugar is caramelised and really sticky sauce-like consistency. Add the other ingredients into the pan or in a large bowl mixing thoroughly. Flatten the mix using the back of a metal spoon. Place in centre of the oven for twenty minutes or once edges look golden; leaving to cool in the tin; cutting into slices once cold.